AV Voice Changer Software is useful for users who want to have a fun time online. They can use it to create exciting conversation environments while doing voice chat in instant messenger programs, or to make humorous fun voice chat/voice calls with PC-to-Phone applications, or to do song remixes to renew your favorite songs, etc. 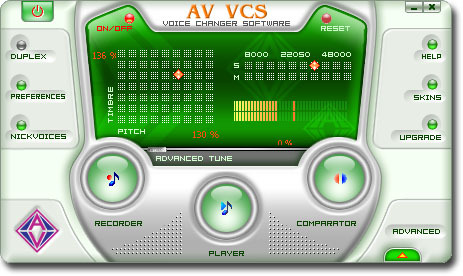 AV Voice Changer Software stands apart from other online or computer-based voice changing programs because of its unlimited ability to change and enhance voices and sounds, and its ability to produce high quality audio output. In real time, change your voice to female or male for voice chat, phone, online games using the dual voice changer algorithms: Hooking and Virtual Audio Driver. AV MP3 Player - Morpher 3.0.10 - Morph music, tempo, add effects. Play & record, convert, rip and burn CDs. AV Voice Changer Software 7.0.15 - Change your voice over IP and PC to phone in real time with "quick" nickvoices. AV Voice Changer Software Diamond 7.0.15 - Change your voice online and in-game in real time with "quick" nickvoices.